In FM, AM, SAM and SSB demodulator modes, you can use SQL to force the audio output to zero when there is no signal. SdrDx offers both a noise detecting squelch and a signal level squelch for FM and AM, and a signal level squelch for SAM and SSB. 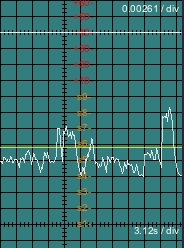 In noise mode, you will observe that usable AM and FM squelch levels are different; this is because the two demodulators present different noise characteristics. Note that squelch only works in AM and SAM mode when AMS. When using the level-based squelch, in SCP oscilloscope mode, observe the yellow "squelch line" that indicates where the squelch setting intercepts the signal level. A little playing with this, and you'll get very good at selecting the exact squelching effect you want. You can use the mouse-wheel or a left-click to adjust the squelch level when SCP and the mouse is over the oscilloscope display. MSQ allows stored memories to set squelch on recall; this in turn can enable smarter scanning, where one channel requires a stronger squelch than the next. The upshot is that you can scan a frequency with strong QRN right next to one with very quiet conditions, rather than having to set just one squelch level for the strongest noise. On the other hand, if you want to use just one squelch level for everything, just leave MSQ.